The term fresh concrete means the wet mix of concrete ingredients before they begin to set. In other words, the plastic state of concrete is the fresh concrete. Sometimes it’s called green concrete. Actually, When the wet mix of concrete ingredients begin to set but not fully set, it is called green concrete. And, when the concrete mix is fully set that is called hardened concrete. 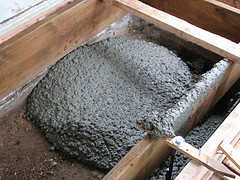 The ability of fresh concrete to fill the various shaped form is called workability of concrete. Workability depends on the batching in fine elements, quantity of water, temperature, batching in cement and so on. High workability will cause segregation in concrete. To know the workability of concrete slump test is done on site. See “All about slump test”. Changing the concrete state from plastic to hardened state is called setting of concrete. The time concrete takes to change the state is the setting time. Setting time depend upon the properties of cement. To increase or decrease the setting time admixtures can use in concrete mix. Bleeding: “Bleeding in concrete” is sometimes referred as water gain. It is a particular form of segregation, in which some of the water from the concrete comes out to the surface of the concrete, being of the lowest specific gravity among all the ingredients of concrete. Bleeding is predominantly observed in a highly wet mix, badly proportioned and insufficiently mixed concrete. In thin members like roof slab or road slabs and when concrete is placed in sunny weather show excessive bleeding. Due to bleeding, water comes up and accumulates at the surface. Sometimes, along with this water, certain quantity of cement also comes to the surface. When the surface is worked up with the trowel, the aggregate goes down and the cement and water come up to the top surface. This formation of cement paste at the surface is known as “Laitance“. In such a case, the top surface of slabs and pavements will not have good wearing quality. This laitance formed on roads produces dust in summer and mud in rainy season. When cement comes in contact with water, a chemical reaction begins. This reaction is called hydration. If the mixing water dries out too rapidly before the cement has fully hydrated, the curing process will stop and the concrete will not harden to its intended strength. Hydration occurs more rapidly at higher air temperatures. Hydration itself also generates heat. This heat of hydration can be helpful during cold-weather construction but harmful during hot-weather construction. The chemical reaction between water and cement first forms a paste which must completely coat each aggregate particle during mixing. After some time, the paste begins to set and after a few hours it lost its plasticity entirely and becomes harden concrete.